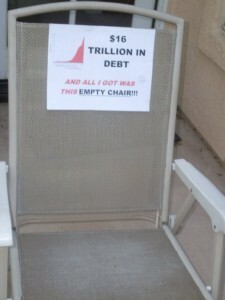 Watcher’s Council Nominations – Empty Chair Edition | Virginia Right! This week’s contest is dedicated to Clint Eastwood.Who proved once again that a man, even a president has got to know his limitations. And of course, to Professor Bill over at Le·gal In·sur·rec·tion for a brilliant idea. This week, Right Truth, Tina Trent.com, Ask Marion,Boker Tov, Boulder , and The Pirate’s Cove took advantage of my generous offer of link whorage and earned honorable mention status with some absolutely excellent pieces. Simply head over to Joshuapundit and post the title a link to the piece you want considered along with an e-mail address ( which won’t be published) in the comments section no later than Monday 6PM PST in order to be considered for our honorable mention category. Then just return the favor by creating a post on your site linking to the Watcher’s Council contest for the week when it comes out Wednesday morning. The Political Commentator – Do bankers and class warfare in the U.S. = immigrants and racism in Greece? Simply Jews – Eastwooding Clint? You are just making his day. The Mellow Jihadi – Pakistani Christian Girl Gets a Reprieve? Tina Trent.Com – What The Heck Does Democracy Look Like, Again? Yid With Lid – Democrats Strip Pro-Israel Language From Platform submitted by VA Right! ← MADELEINE ALBRIGHT has SOME NERVE discussing OUTRAGEOUS STATEMENTS!